Over the many years of working with captive primates, I have witnessed many wonderful transitions, from existences filled with pain and misery to that of a healthy, enriched life. I've also seen many disturbing cases where the chance for anything resembling normalcy was rendered almost impossible given the abnormal upbringing and early developmental stress associated with being forced to live as a pet. The difficult-to-watch and heart-wrenching behavior I've observed in those damaged monkeys leaves no doubt in my mind that people who breed, buy, sell, and otherwise promote the use of primates in the pet trade, regardless of intentions, are doing a grave injustice to the animals they care for and often claim to love. I have had lengthy discussions with prospective buyers during which we went step by step through the breeding and selling process, how an infant's early separation from his or her mother causes severe distress, the behaviors likely to be witnessed as the monkey matures in an abnormal environment, and the difficulty of later attempting to undo at least some of the damage caused by the unnatural and unhealthy rearing to which the monkey was subjected. I have often felt frustrated and exasperated when it became clear that no amount of factual information was going to deter that person from doing what they wanted to do all along, which was to own a pet monkey. And, I know first-hand how that horror story plays out. So, when I opened the package from the Born Free USA office and read the letter that had been forwarded to me, it really had an emotional impact on me. We receive some very nice notes from people expressing how much they appreciate what we do for the voiceless, and those notes are encouraging and very much treasured. But, this note wasn't addressed to me, or a staff member, or even a volunteer. 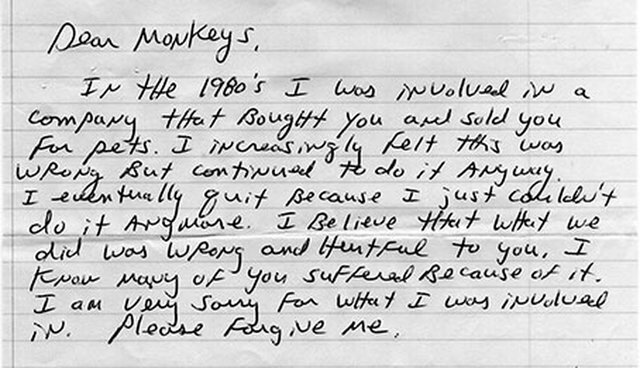 It was from someone we had never heard of and included a large donation for the primate sanctuary and began like this: "Dear Monkeys,"
As I read the hand-written letter (pictured above and transcribed below), my frustrations seemed suddenly distant, small, and childish as I realized that I was witness to yet another wonderful, life-affirming transition-this time, in a fellow human. And, Danny: we forgive you. In the 1980's I was involved in a company that bought and sold you for pets. I increasingly felt this was wrong but continued to do it anyway. I eventually quit because I just couldn't do it anymore. I believe that what we did was wrong and hurtful to you. I know many of you suffered because of it. I am very sorry for what I was involved in. I am sending some money in an attempt to make amends. I hope this gets you some nice treats and makes your life better. Again, I am deeply sorry.